It has long been known that business Intelligence (BI) can be instrumental in helping hotel operators make smarter and more timely decisions. Now a new groundbreaking study from Starfleet Research, the leading provider of IT market research for the hospitality industry, explains at length how hotels that use advanced BI tools and capabilities to transform raw data into actionable insights are driving significant improvements in various aspects of their operational and financial performance. This definitive and unbiased resource, 19 pages in length, was underwritten by Rainmaker, a market leader in profit optimization solutions for the hospitality and gaming industries. The research findings were derived from online surveys conducted with more than 350 hotel executives and other industry practitioners. The practical guide contains a wealth of information about the latest BI technology innovations, how next-generation solutions are being utilized in the hotel industry, and best practices and expert recommendations for hoteliers to keep in mind as they embark on the journey to improve their business intelligence capabilities in their quest to drive continuous performance improvement. 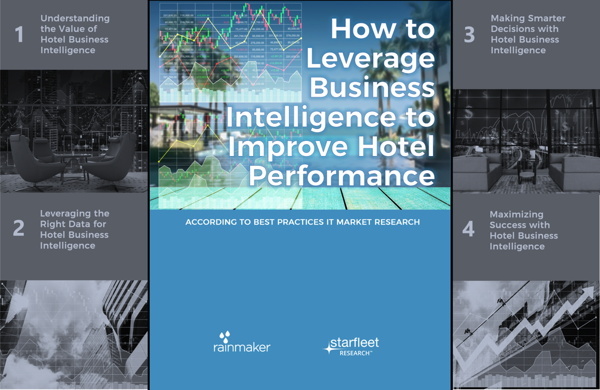 Leveraging Business Intelligence to Improve Hotel Performance is available for complimentary access, courtesy of Rainmaker, for a limited time only. The co-branded eBook is the latest in a series that looks at next-generation hotel technologies. It was independently produced and distributed by Starfleet Research, which ranks as the leading provider of best practices IT market research and recommendations for the hospitality industry. Each year, Starfleet Research benchmarks best practices in technology-enabled business initiatives across thousands of hotels and resorts. Its popular Smart Decision Guides, which have influenced the IT decisions of tens of thousands of senior executives, focus on such topics as Hotel Property Management Systems, Hospitality Revenue Management, Hotel Guest Experience Management and Restaurant Management and POS Systems. Hospitality Trends has a very loyal audience and many companies take advantage of our ability to fine tune information about your organization for them.